This Vu Filters 75 x 100mm Sion C Soft-Edge Graduated Neutral Density Filter Kit from B&H contains two filters that can be used individually or in various combinations to improve the results of your landscape photography by preventing overexposure in specific areas of an image, such as bright skies, while allowing for a normal, unaffected exposure in the other regions of the image. The included filters both feature a soft-edged line of transition and reduce the amount of light entering a lens by up to two and three stops, respectively. A soft-edged line of transition is particularly useful where the transition between sky and foreground is indeterminate, such as images featuring mist, fog, or the tops of trees. To allow these filters to be placed in front of a lens, a separately available Vu Filters VFH75 75mm Professional Filter Holder or a filter holder system that can accommodate 75mm wide, 2.3mm thick filters is required. 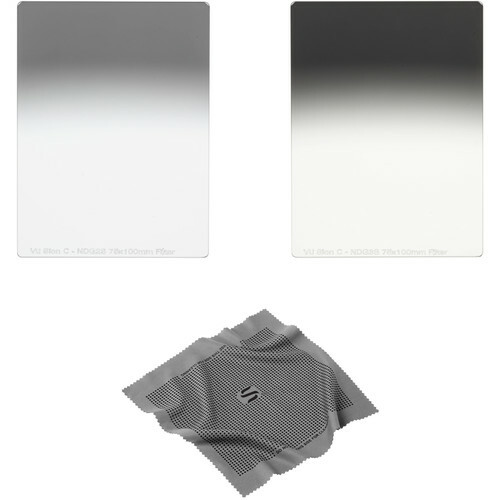 Vü Sion C Graduated Neutral Density Filters provide filmmakers and photographers a broad range of flexibility in managing their exposure and depth of field. Available as rectangular glass filters in fixed density increments, Vü Sion C Graduated Neutral Density Filters feature a unique White Balance Multi-Coating, specially formulated Flat Wave Overcoat, and are designed to be the perfect tool when your creative vision demands it most. These filters are held to the highest optical resolution standards and will not degrade your image when placed in front of a lens. Optic coating that gives the filter's front surface a "smoother-than-glass" finish, making filter maintenance and care much easier. Box Dimensions (LxWxH) 5.3 x 5.2 x 0.9"
Box Dimensions (LxWxH) 5.6 x 5.1 x 0.8"